Thank you in advance for all your time, energy, enthusiasm, and hard work helping to make this season a great experience for all SYHA players. The Team Manager is the liaison between the coaching staff and parents. It is your primary responsibility to support the coaching staff by reducing the administrative burden of team activities so they can focus on coaching the players on and off the ice. The following is a comprehensive list of duties that a Team Manager may be requested to handle. Actual duties will vary from this based on the preferences of your team’s coach. Some coaches request very little collaboration while others willingly accept any and all assistance offered. An organized Team Manager can make for a great year for coaches, players, and parents. Your time and effort is greatly appreciated! 1. Team managers need a USA hockey number. This is at no cost to the TM. 2. TMs (and anyone in proximity to the kids and locker rooms) needs to be SafeSport certified. It takes about 1 1/2 hours to complete ALL THREE SECTIONS. It must be renewed once every two years. Please ask your COACH how he’d like the locker room monitored. It is probably not necessary for the entire team to get certified. You need to be, whether you go near the locker room or not. 3. If we win a game or tie at home, a pic of the score sheet must be sent to CHC. There is a rep listing by age group on the CHC website under “Contacts”. Your family login is the same username and password you will enter to login as the Team Manager. In addition to viewing your personal account, as Team Manager you will be able to email updates to your team and control your ‘Team Page’. If your password is forgotten, login to ‘Edit My Account’ from the ‘Association’ tab on the homepage and follow the instructions to change your password. Overall Communication – Keep your team informed of all relevant information throughout the season and assist your coach in passing along messages. You may use the SYHA.ORG email system, apps or your personal email to communicate with your team. Uniforms – Work with your Coach to facilitate the distribution of hockey jerseys and socks to team members ensuring that all players have unique numbers. Make players aware that game jerseys and socks are for games only and should not be worn for practices to help prolong the life of the items. If a player needs a Sharks practice jersey, the Manager or Coach should contact the SYHA Equipment Coordinator on player’s behalf to request one. Remind parents and players that uniforms are to be kept on hangers throughout the season and should NOT be thrown into smelly hockey bags. Please reinforce this policy throughout the season. USA Hockey Consent to Treat Form –SYHA requested all players fill out a Consent to Treat form during the registration process. This allows SYHA to seek treatment for a player injured on the ice or otherwise at the rink. While submitting this form is not mandatory to play in the program, it is highly recommended, as most parents do not attend every game and practice. The SYHA Registrar or Manager Coordinator will provide you with a set of the Consent to Treat forms for the players on your team shortly after the rosters have been finalized, typically in late September. In order for coaches to have access to these forms at each game and practice, we ask that you create two sets and place them each in a folder and give one to the head coach and one to an assistant coach. Please remind your coaches to have these forms on hand at every practice and game. All copies should be shredded at the conclusion of the season. Note: Along with the Consent to Treat form for each player, every team should also have the current official, stamped USA Hockey Roster and emergency contact Information for every player in the folder for all games and practices. Stamped USA Hockey Roster Sheet - Once rosters are finalized at the beginning of the season, the Registrar will provide you with your team’s Roster Sheet. 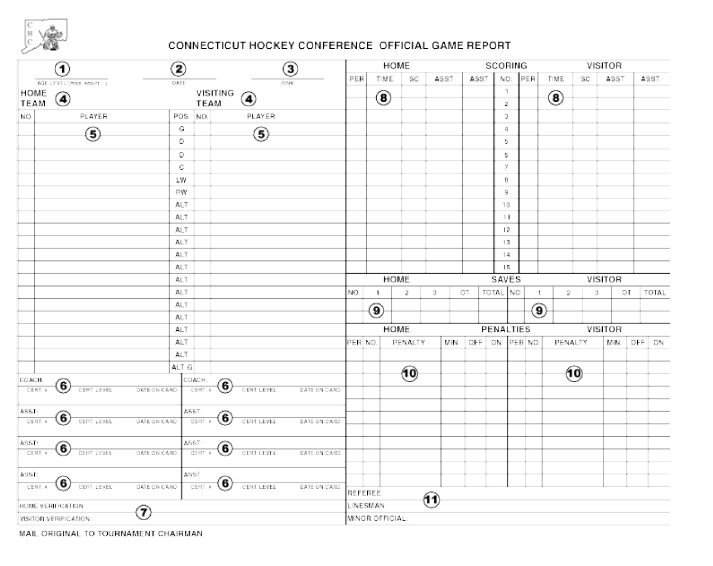 You must have this sheet on hand at every game (see above note), especially at any State Playdown games. At any point in the season an opposing team could ask to see your team’s Stamped Roster Sheet to verify a player. 7. This is done by referee/scorekeeper: Home & Visitor Verification – one coach from each team MUST sign the score sheet. 8. This is done by referee/scorekeeper: Scoring - enter goals and assists as they are called by the referees - remember to enter and circle the total score for each team. 9. This is done by referee/scorekeeper: Saves – enter the goalies number and track all saves (not shots). If the game is split between two goalies repeat the process on the second line. 10. This is done by referee/scorekeeper: Penalties - enter penalties as they are called by the referees. 11. This is done by referee/scorekeeper: This area is for the referees to print and sign their names. Please have all referees print their state number next to his or her name. Create a binder with all team player consent forms, score sheets, labels and family contact info, this must be you or the team for all games. Communicating weekly to the team on the weeks schedule, game/practice changes, weather and traffic. Handle communication with team for any communnity outreach programs and volunteering. Work closely with head coach on expectations for the season. Arrange locker room monitors and schedule. Team Fund – Managers offer to collect money at the beginning of the season from each family ($100 to $200) to cover: Coaches end of the year gifts, team holiday party, team end of the season party, off ice team building and other team activities. Keep track of your team’s expenses. Give a mid-season update on the team funds and give back money that has not been spent. Holiday Party/End of Season Party – It is at the team’s discretion to choose doing a party(s). Current/Past Team Managers to reference – should you have any questions please feel free to reach to other team managers or the SYHA Board.